Submitted by Jeff Buster on Fri, 08/28/2009 - 16:01. I was looking through un-catalogued images for some shots of the steel truss repairs recently completed on the I90 inner belt bridge, in Cleveland Ohio (the PD just ran a story on computer stress modeling of the trusses - I don't think their story is correct when it suggests that the stressed areas were "damaged"), when I happened to notice something about this spider web image. One afternoon I had been using a belt sander outside to smooth some pine boards and the wind took the fine saw dust and coated a nearby spider web. I thought the web was emphasized neatly by the sawdust, so I took a few images. Today I noticed that the center of the web, and the supporting strands around the outside of the web, didn't have any sawdust stuck to them. So spiders not only have the ability to make the strongest tensile chemical around, and spin it up, down, and sideways, but the spider also has his own sticky surface coating circuit – which he is able to turn on and off precisely. Very cool. I never knew that. Did you? Submitted by Norm Roulet on Fri, 08/28/2009 - 17:18. One day a spider web showed up by a place I like to work, and I left it there and watched it for months. It was fascinating to watch the web develop and break and be repaired and invaded - a real engineering marvel and full time job. I've seen that signal line in action - when a bug hits the web the spider knows immediately and moves in - if you just drop an object in the web it will not fool the spider... not even a dead fly, at least for my pet spider. It only wanted fresh, living meat. Didn't know about the sticky thing... very cool! Submitted by ward14resident on Fri, 08/28/2009 - 18:12. Beautiful. 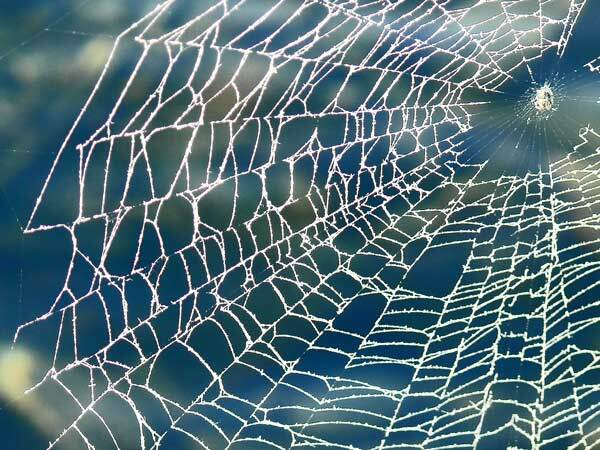 Beautiful picture of the web. Submitted by jerleen1 on Fri, 08/28/2009 - 18:28. As much as I'm not a spider person, I find their webs intriguing. They look like tatted lace and makes you wonder how those itty bitty spiders have the know how to weave such intricate patterns? Submitted by lmcshane on Sat, 08/29/2009 - 08:49. This looks like it could makes some revenue for REALNEO, if it gets picked up and attributed. It's yours, right Jeff Buster? We really do need to be better about attributing photos/posts etc. I am going to take the time to fill out the image properties, when I post. Let's all work at it--standards. Submitted by Jeff Buster on Sat, 08/29/2009 - 13:25. As Norm has repeated over and over – don’t put your intellectual property anywhere on the internet where you give away your ownership or control of your property. Frankly however, I think Norm is too lenient about his allowing others to take his images off of Realneo – and publish Norm’s images without attribution, license, or payment. A few times I have seen Norm’s images used elsewhere, but when I pointed the use out to Norm, he didn’t get any dander up. For my part, a few times either I or a friend have found Buster images used elsewhere without attribution, license or payment. In those instances I approached the copyright violator and requested that they execute a license – limiting their use of the copyrighted material to how it had already been used - and contribute ($50, $100) to Realneo via the PayPal link or by check to the Real Coop post office box. If the copyright violation had been commercially substantial, then other remedies would be in order. If anyone sees any Realneo content or image used elsewhere on the internet or in hard copy (print) – please bring you observation to the attention of the original author here on Realneo, or contact Realneo site administration by clicking on the “contact” link. No one yet knows how internet content may develop monetary or other value – so, from my perspective, the least everyone should do is be careful to place their content on the internet in a manner which allows them to maintain ownership of their creative works. What good is community approval when what was approved gets changed?